Miss You is a delightful read which manages to capture the essence of fate. The story is told by Tess and Gus, two people whose lives intertwine occasionally but who have only ever spoken a few words to each other. Will fate eventually intervene to save these two lost souls from themselves? Tess is unexpectedly thrust into a life she never dreamed of for herself. She gives up everything including her university acceptance to take care of her little sister Hope when nobody else has stepped in to help. Tess struggles to find herself and her own ambitions in the life she passing through. She is almost a spectator, often refusing to make any decisions regarding her own needs or desires. Tess has a giant heart though and loves Hope to the same degree as a mother would love their child. Tess let’s romance into her life but never gives herself over completely, like she is waiting for some feeling that she can’t quite understand. Gus is a smart and intelligent young adult who regularly acts on impulse. He is criticizes himself for not acting in the moment and yet most of events that happen in his life are because of impromptu actions. Gus graduates university and finds a steady girlfriend named Lucy; his relationship with Lucy seems to point to an advantageous match. Yet so,etching is still missing and Gus can’t even bring himself to be full open and honest with Lucy. Instead Gus turns to Charlotte who fulfills he sexual desire but leaves a lot to be desired in the relationship department. With two rocky relationships on the go at once and trying to figure out his career ambitions it seems like Gus’ life can go nowhere but down hill. Miss You is a story about life, fate and relationships. I feel as though fate is like a seed in this book, being blown around but never landing in the soil. So many times Tess and Gus almost meet or do actually meet only with no remembrance and recognition. The story’s motto “Today is the first day of the rest of your life” basically happens again and again. Do Gus and Tess really just have one moment where their lives reach a drastic turning point? I don’t think so. In my opinion, it happens again and again which makes the story more realistic. A few turnoffs for me were for starters the length of the novel; it really is quite long with 433 pages. I think it can be trimmed down and some filler taken out. I really don’t need to know about every dinner date or job that Tess or Gus had during the 16 years of the story. I also would have liked Gus and Tess’s lives to converge more, there was such a long time in the plot where it was just their own individual stories. And finally, the ending (I won’t offer a spoiler) BUT it could have been more believable and more developed throughout the story so that it fit with the rest of the plot. Thanks for reading my review and I’d like to thank Harper Collins Canada (HCC First Look program) for an advanced copy of the book! And I love the cover, it is very eye catching. My READ50 for 2017 is off to a good start. Some months I find I have more time and interest in reading than others and January has been a busy reading month for me. So far I have read 7 books for my reading challenge this year. My list of to-read books is getting shorter though so if anyone has any recommendations for me please feel free to comment and suggest some! This book is worth giving a consideration. With romance, a historical home and three women from one family lineage, The Forgotten Room is an engaging historical fiction. The story moves between three different women but if you pay attention it is not difficult to follow the diverging plots. It is even more interesting when you realize that it was written by three different authors all working together and taking turns at different parts of the plot. The story itself is a bit unbelievable but sometimes that is what we hope for in a novel, that it will take us somewhere other than real life. I didn’t think it was outstanding but definitely worth a 3 star rating in my opinion. Despite receiving some bad reviews on GoodReads, I actually really enjoyed this book and wouldn’t hesitate to pick up another novel in the series. It is really not as bad as some reviewers make it out to be. Yes Maggie, the heroine, was a little naive but women in general were not given a lot of responsibility during that period in history. I appreciated the author’s notes at the end of the book where she describes her conversations and correspondences with real war time secretaries. One lady interviewed mentioned that in real life their secretarial responsibilities were definitely not exciting or glamorous and they certainly did not have time for romance. Obviously a fictional novel wouldn’t be as exciting or fun to read if the author only wrote about the lonely and dark lives of the secretaries during war times. All in all I liked it and give it 4 out of 5. I think time for big expectations and hype with John Grisham novels has come and gone. I enjoyed reading The Whistler but it fell short in some ways. There were moments when it captivates you and others when you just want to skip a few pages of lengthy detail. Lucy, the heroine, works for the Florida Bureau of Judicial Conduct and she and her partner Hugo are asked to investigate the fraud of a long serving and influential judge. The fraud involves large sums of offshore money, unexplained murders and a Casino run on Native American lands. There are some unexpected twists in the plot but for the most part the narrative is smooth and somewhat predictable. Furthermore, the end of the book feels rushed and anti-climactic. Grisham neatly wraps up all loose ends in the conclusion by foregoing narrative and just recaps the events so you can end the book. The ending feels rushed and unfulfilling. I would still recommend this book but I will definitely have lower expectations for any new John Grisham books that might be published. I took a chance on trying to find a new mystery novel series with a female heroine. Death of An Avid Reader was harder to get into than I was hoping. In the first few chapters I couldn’t figure out what story thread I was trying to follow as Kate Shackelton, the main character, was jumping all over the U.K. After the third chapter I couldn’t figure out what was going on and almost gave up. I kept plodding through and eventually the story started to make sense and I began to recognize the characters. I think there were just too many unintroduced characters in this novel to make it successful. It was difficult to follow and more than a few times I was completely lost to who a character was when a name was mentioned. By the end of the book I enjoyed the main thread of the story and I would pickup a second book in the series just to see if some of those characterization and plot problems have been worked out in subsequent books. Happy Holidays! 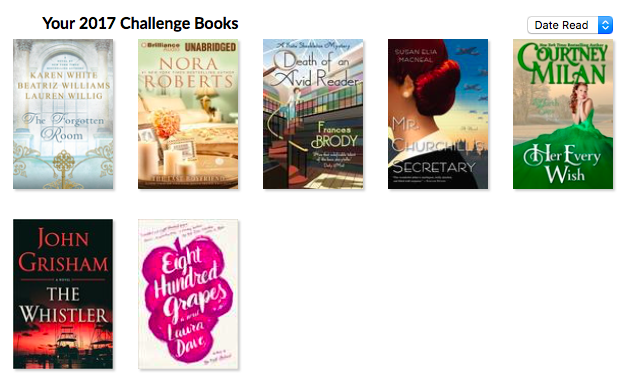 It’s the last month for my 2015 READ50 challenge and I only have 3 more books to go! I have finished up the last published books in the C.S. Harris series Sebastian St. Cyr. I really enjoyed all of these books. At the core of each of the stories is a little piece of true British and/or French history as well as some conspiracy theories which the author uses as inspiration for her fictional tales. The historical aspects of the novels are what draw me in and the author does a good job at making the events in the story seem historically believable. I would classify this series as solidly in the Historical Fiction genre but leaning slightly towards Mystery. Romance is not prevalent in the themes of these novels but rather they are mysteries full of revenge, conspiracy and murder. Some threads in the storyline progress very slowly and leave me wishing there was more development to Sebastian and Hero’s characters from novel to novel. I find as a reader I only get tiny bits of what Sebastian and Hero are thinking. Furthermore, Hero plays a very small role in the last few novels. It would be nice if she came more to the forefront in the next book(s) in the series because I think she has the makings of a strong heroine. C. S. Harris’ next book in the Sebastian St. Cyr series, When Falcons Fall, is scheduled to be published March 01, 2016. If you are looking for a good mystery series I highly recommend these books. For those in the Leduc Public Library system you usually have to request the books as they all seem to be scattered around Alberta rather than one library holding the entire series. Happy Fall everyone! Here are a couple of reviews for the books I have recently finished…14 more to go for 2015 for my Read 50 list!!! Coming up next on my “to-read” list I have: Go Set a Watchman by Harper Lee, The Taming of the Queen by Philippa Gregory, Circling the Sun by Paula McLain and The Other Daughter by Lauren Willig. VERY similar to All the Light We Cannot See by Anthony Doerr BUT I felt The Nightingale was better. Both novels were set in WWII German occupied France and both novels also have a strong father-daughter relationship that has been woven into the plot. Unlike Anthony Doerr’s novel, The Nightingale keeps flowing smoothly from event to event and the character development is very strong. The reader can understand the way Vianne, Isabelle and their father change over the course of their lives because of the life experiences that they have to endure. They all work through feelings of grief, fear and determination together. Each character in the novel is constantly making choices to stand up for what is right in a world where it was easy, and sometimes safest, to look the other way. Vianne is happily married and mother of one only to have her husband quickly sent away to fight during the war. Vianne acts selflessly trying to protect her daughter, her close friends and her family home. Like many women, she defaults to routine during her everyday life to try to handle all the external events that she has no control over. She tends to her garden, cooks meals and takes care of her home while the world directly outside is falling apart. Vianne isn’t just a bystander though and eventually finds the determination to stand up for some of the things going on around her. Her closest friends are being taken away to concentration camps and having to leave behind children in need of protection and care. Isabelle is by far my favourite character in the novel. She is intense and always speaking her mind without thinking of the repercussions.She is free to follow her impulses because she is young and unmarried. I did feel a bit heartbroken when Isabelle gets sent to a concentration camp and wish that part of the story was developed a bit more. It would have been nice if somehow Isabelle’s story had continued separately in another novel. I found myself secretly hoping throughout the book that the elderly lady was going to turn out to be Isabelle. All in all, I WOULD definitely RECOMMEND this book to those who enjoy WWII historical fiction. It was just good but nothing spectacular. Amelia didn’t come across as a strong person consistently throughout the book; although she had some moments of self-determination. Her love for Lucy didn’t come across as believable enough for me, and I wish Graham’s attachment to Lucy was also more developed. As with A Lady At Willowgrove Hall, the Biblical scriptures seemed forced, almost an oversight and edited in after the rough draft was done. I agree with other reviewers in that the summary makes this book appear more promising than it is and I am left giving The Heiress of Winterwood a 3 out of 5. I think when you have read a ton of historical fiction like I have, you find this storyline a bit repetitive. I felt like I had read this story before with different names and a slightly different plot. War hero, a damsel in distress and a rogue ex-husband just about sums up the plot. I really enjoy a good historical fiction and a romance but this one just felt like the author was copying too many things from other books and there wasn’t enough uniqueness to the style of writing to make me want to read any of her other books. I was left feeling disappointed when I had looked forward to getting to this book on my “to read” list. An easy, quick and enjoyable read but this book was also very predictable. At times I felt like the author was putting in sentiments in Cecily’s character that didn’t make sense. I also felt like the references to Proverbs and Biblical passages were forced. All that being said, I would still recommend this book for your bedside table. Well, with it being the end of summer and now the first week of back to school, my reading list has been pretty light. Most of the books I have chosen to read lately have been for my enjoyment only and I have not tackled any challenging topics. Sooooo if you are looking for some easy reading, check out Carol K Carr’s Madam of Espionage series – as I read all 4 with a break for Island Beneath the Sea by Isabel Allende in the middle. Up next on my Read 50 list I have: A Curious Beginning by Deanna Raybourn, Orphan Number Eight by Kim van Alkemade, What Angels Fear by C. S. Harris and If I Could Turn Back Time by Elizabeth M. Harbison. I found myself enjoying the Madam of Espionage books more than I thought I would. I was expecting a romance series with a hint of mystery but in fact this series leans more towards a mystery with a strong heroine playing secret agent. Some of the long-winded descriptions found in the first book, India Black, got shorter as the series went on. To briefly condense the premise of the series, there is a strong-willed heroine, India, who is recruited to help the Prime Minister of Britain (Dizzy) with political conspiracies that need to go away without the public knowing. India is often paired up with the dashing male hero and secret agent, French. Vincent is their sidekick and he plays the role of lackey and messenger but regularly finds himself in the role of unlikely hero. The author Carol K Carr does an excellent job of describing London and making the reader feel like they know what it would have been like to walk the streets of London in the 1800s. The themes all revolve around threats to the government which place India and French in immediate danger throughout the stories. That being said….what you WONT find in these books is a compelling romance (despite what the covers may depict). India and French’s relationship is pretty stagnant and gives little hope that it will ever go past the hint of romantic interest to a more well-rounded relationship. After 4 books India and French are about as close to beginning a relationship as they were the moment they met in the first book of the series. All in all I would recommend this series. The books have easy and enjoyable storylines and will keep you interested. By the end of the series I was hoping there was more to India Black but I will just have to wait! I will admit, this novel took me a while to finish. I could only read a bit at a time as it felt like there wasn’t enough action in the plot to keep me wanting to come back to it. The plot was a bit repetitive at times, the same events happened over and over with only slight differences. I DID however enjoy the descriptions of life during the slave trade in Haiti and how the author integrated religious beliefs into the plot. I couldn’t help my inability to understand the mindset of Valmorain, the plantation owner. I just can’t grasp how people were able to devalue human life the way they did during the slave trade. I have read many books on the slave trade, but this book did not give me that warm feeling like everything was going to be ok in the end. Zarité had trial after trial throughout her life and her optimism to keep going seemed a little strained for me to relate with. If you like this sort of fiction I would recommend The Book of Negroes first before recommending Island Beneath the Sea. Historical fiction is my favourite genre but I found India Black a little harder to get through than other novels in the same category. I found the political descriptions too lengthy and skipped paragraphs at a time that were adding nothing to the plot. Overall I enjoyed the story and love French’s character. India Black was good enough for me that I have ordered the next few in the series to try out. David Ashton’s stories of Inspector McLevy always have enough drama to keep me interested. It is true that they can sometimes lose me somewhere in the middle for a bit but I always manage to catch up to the characters. I also was intrigued by Robert Louis Stevenson’s character in the book and of course had to google a bit more about his life to get a full picture of who he was. His character added a great deal to this novel and I think Robert Louis Stevenson in real life lived such an exciting life going from a life in Scotland and Britain to exploring Hawaii and Samoa. A great series if you like inspector/mystery novels. A 5 out of 5 for a summer beach read. I loved Ella and Blake and thought they were really entertaining characters. The lies they told one another just got bigger and bigger until they could blame no one else but themselves for the trap they had created. I appreciated how Ella became more strong willed as the story went on and by the end of the book she realizes that she needs to act in order to accomplish her life goals. The theme of love is threaded throughout the story; it leaves the reader with no answer on what love really is other than a changing and morphing emotion that no one can control. The ending leaves you feeling hopeful and optimistic towards the lives of the characters. A great book for a quick summer read. I read this book in one day. It was a quick read and I didn’t find it difficult to get through. I liked the way Toni Morrison goes back and forth between characters but didn’t care for any of the characters in particular. The book didn’t give me any hope or sense that anything would change for any of the characters. Bride’s behaviour was very self focused. She was successful and didn’t appear to value her own life or those around her. I think Bride’s best quality was that she seemed to genuinely care about the troubles people face but yet she never made the effort to actually help anyone. I hate feeling at the end of a book that the world is a scary place and that there are so many child predators out there. I know these things exist but I wouldn’t normally pick up a book to read about it. I’m left feeling so so about this novel so I gave it a 3 out of 5. Anthony Doerr really captures the tones of WWII and what it must have been like to be growing up during that time in history. His story moves between the life of Werner, a German orphan, and Marie-Laure a young Parisian. This story gives us a juxtaposition of individual realities during the war; each character battling against their own fears as their lives are upturned. Werner is an orphan but gets selected to be one of a few hundred children who will be trained up and educated in a special German school. He is gifted with intelligence and is given a position constructing radios so he can catch radio signals for the German army. He leaves behind his sister Jutta at the orphanage who provides the female counterpoint to growing up German during WWII. Marie-Laure, blind at an early age, has her own strengths of freewill and a determination to live and thrive with her disability. Her blindness heightens her sense of sound and smell which she uses to survive through major life changes. She and her father must flee Paris and move to Saint-Malo and the home of her wealthy great-uncle. When Marie-Laure’s father is taken prisoner and sent to a German war camp, she must learn to survive on her own and learn to discern between those who are trustworthy and those who are not. I really enjoyed the way the plot of All The Light We Cannot See centers around radio broadcasts and how it ties the story together nicely. I also appreciated the way the author did not sugar coat the story as the reality during WWII for people on both sides was not a positive experience. I would definitely recommend this book to anyone who enjoys historical fiction. I have so far really enjoyed the Inspector McLevy series. I find them engaging and they have enough conspiracy and mystery to keep me interested. I found this book a little more predictable than the first but otherwise a great read.